“Leonard Boswell served the state of Iowa and our nation with distinction. As a State Senator, as Iowa Senate President and a member of the U.S. House, Leonard fought hard for his constituents and for the best interest of the state that he loved. “In Congress, he supported expanding access to affordable health care, providing better service to our veterans, and making higher education affordable for working Iowan families. The Boswell family would like to inform the public of the following services celebrating the life of Congressman Leonard Boswell. A visitation and viewing will occur on Friday, August 24, 2018 from 5:00 PM to 8:00 PM at the Community of Christ Church at 531 West Main Street, Lamoni, Iowa. Funeral services will be held on Saturday, August 25, 2018 beginning at 10:30 AM at the Shaw Center on the campus of Graceland University in Lamoni, Iowa. The Shaw Center is located at 1 University Place, Lamoni, Iowa at the center of campus. There is ample parking nearby. 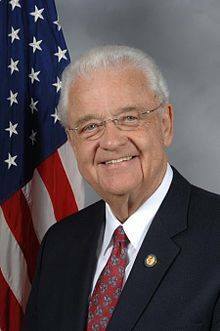 Immediately following the funeral, there will be a procession to Rose Hill Cemetery in Lamoni where the Congressman will be laid to rest with full military honors and graveside religious services. Rose Hill Cemetery is located on the west side of Lamoni on West Main Street. Following the burial, the Boswell family will be hosting a party at the family farm to celebrate Congressman Boswell’s life, complete with food, drinks, and fireworks. The address of the farm is 28308 177th Avenue, Davis City, Iowa 50065. Members of the press are welcome to attend all events. Slade Funeral Home of Leon, Iowa is handling the arrangements. The funeral home may be contacted at 103 NE Mill Street, Leon, Iowa 50144. The phone number for the funeral home is 641-446-6211. In lieu of flowers, the family is establishing a scholarship at Graceland University in honor of Congressman Boswell that will benefit young people interested in studying agriculture. Donations to the scholarship fund may be sent to directly to Slade Funeral Home. Press or dignitary inquiries may be directed to Grant Woodard at 515-557-0633 or at gwoodard@gmail.com.